The C+ sedan segment caters to people who want a bit of everything - luxury, comfort, convenience, performance and practicality. For those whom efficiency and reliability hold priority, the choice narrows down to the Toyota Corolla Altis diesel, and that choice has led to it being the highest sold car in the segment and a winner in our diesel sedan comparison test. 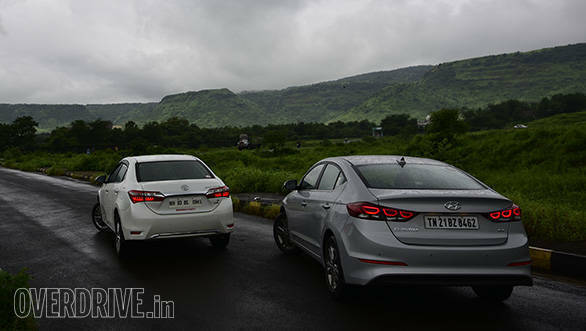 Now, Hyundai has reintroduced the Elantra. It's all-new, but is it better than the segment leader? Time to find out. The 11th-generation Corolla Altis and the newest on our shores caught everyone's attention. It was a substantial shift in design terms for Toyota. It wasn't subtle and instead possessed a dynamic and edgy styling language. Whichever angle you chose to look at, the Toyota Corolla with its prominent lines, the tall shoulder line, the wraparound headlamps and the beaky front end made it look sharp. Despite it being on sale since two years, it still looks striking. The Elantra on the other hand is an 'inspired design', not as much inspirational as its predecessor. So borrowing certain design cues from other carmakers manages to make it look handsome. There is no denying that the Elantra is an attractive car, probably better looking than the Corolla to some. Step inside the Corolla Altis, and you are greeted by a layered but flat dashboard that houses slim air vents and a digital clock. There's a 7-inch touchscreen infotainment system in the centre which gets a carbon finish. The steering wheel and gear lever get a silver-like finish. Overall, the cabin has a simple yet functional layout. The quality of cabin plastics, however, leaves a lot to be desired. 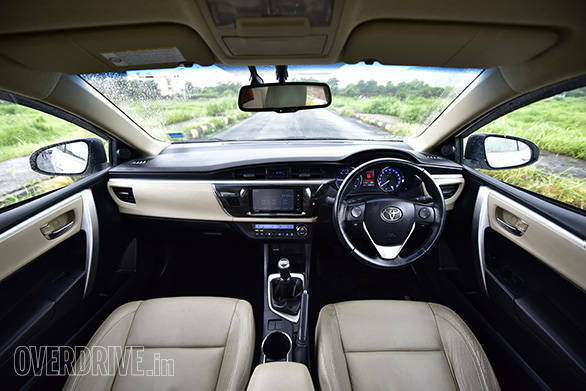 The interiors are one area where the Elantra completely outshines the Corolla Altis. Its all-black interior looks and feels more upmarket. Also, the quality of materials is much better. However, the Corolla Altis betters the Elantra in terms of seat comfort and cabin space. It offers more leg room, knee room and shoulder room while the seats offer better support. On the Elantra, the rear-seat cushioning is a bit too soft and under-thigh support could be better. Both get features expected from cars of this segment though the Elantra, like all cars typically Hyundai, offers just that little bit more. For instance, the Elantra gets rear A/C vents while the Corolla does not. The Elantra also has reverse parking sensors in addition to the rear camera while the Corolla just has a camera but no proximity indicator. On the powertrain front, the Corolla Altis carries forward the reliable and highly efficient 1.4-litre turbocharged diesel engine from its predecessor. This diesel unit produces 88.4PS and 205Nm of torque which makes the Corolla Altis the less powerful car in its segment. In fact, some of the diesel hatchbacks on sale today are much more powerful! Keep aside the power deficit, diesels are known for their torque, and in this regard the Corolla falls short of the Elantra by 55Nm. 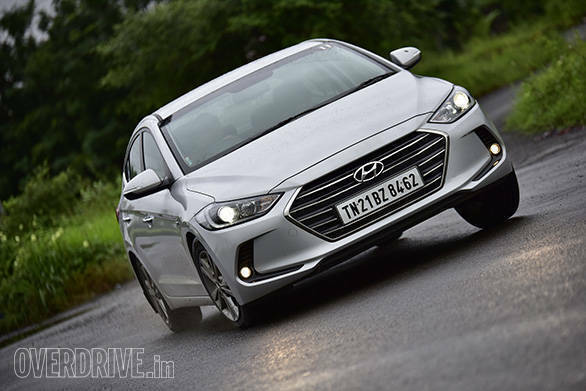 Its 205Nm of peak torque is no match for the Elantra's 260Nm peak torque, and this has no bearing on how early the turbo spools up or what rpm max torque is available at. Incidentally, the turbo on both cars kicks in at more or less the same rpm though max torque on the Corolla comes in at 1800rpm, 100rpm before the Elantra's. So yes, the Elantra feels like it has better drivability, whereas in the Corolla you have to drop a gear to get back into the powerband. 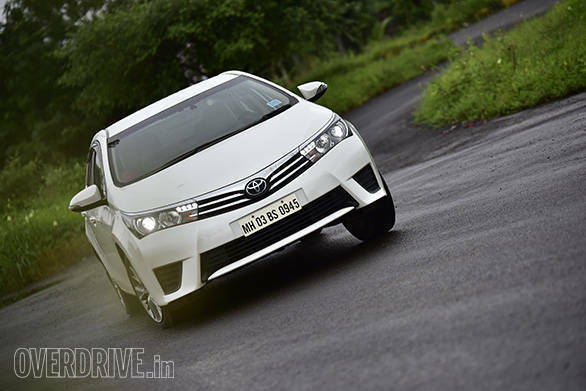 During our tests, the Corolla Altis took a good 14.68 seconds to sprint from 0-100kmph. However, this diesel delivered a stellar 17.14kmpl in the city and a highly respectable 23.52kmpl on the highway. Compared to the Corolla Altis, the Elantra's motor is quieter and more refined, feels peppy and reacts much quicker to throttle inputs. The power delivery is linear, and it sprints from 0-100kmph in 10.5 seconds. However, during our fuel-efficiency tests, it delivered 14.57kmpl in the city and 20.2kmpl on the highway, less than the Corolla by a fair margin. The Corolla's electrically assisted steering feels unusually heavy at parking speeds. However, at higher speeds it offers good feedback, giving you a sense of control. It gets a comfort-oriented suspension set-up which does a very good job at soaking up the road imperfections. Around bends it will confidently stick to the chosen line, but it's not a car you will enjoy pushing hard. In comparison, the Elantra offers a better balance between ride and handling. The suspension cushions the impact from potholes and large craters impressively. Also, the ride quality improves as speeds increase. The suspension doesn't crash through potholes or ruts, and it simply glides over the worst of our roads without jarring the occupants. The ride is definitely superior compared to the Corolla. Unlike its predecessor, the 2016 Elantra feels composed while cruising at highway speeds. Also, when driven in an enthusiastic manner around bends, it feels more composed than the Corolla. The Elantra's steering is also much lighter at slow speeds, making it easier to manoeuvre in traffic, and it weighs up well at higher speeds and responds more directly than the Corolla. Unlike the Corolla Altis, however, the Elantra's brakes lack bite, and you need to literally stand on the pedal to come to a quick stop. The Elantra and Corolla also have almost the same safety features. The Elantra scores one mark more than the Corolla because it also offers an electronic stability programme or ESP. 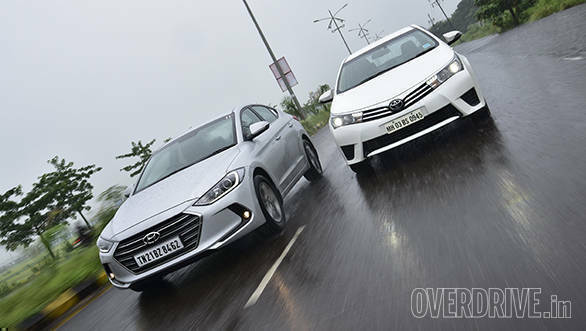 In terms of pricing, there's very little to separate the two with the Toyota Corolla Altis GL priced at Rs 17.57 lakh while the Hyundai Elantra SX (O) costs Rs 17.69 lakh (both prices, ex-showroom Delhi). Overall, the Hyundai Elantra diesel scores higher points than the Corolla Altis with respect to performance, convenience features, ride and handling, and overall build quality. However, despite being an all-new car and better than its predecessor, the Elantra doesn't take the segment forward. Question remains - is the Elantra a better car than the Corolla Altis? Let's put this way, it's the newer car and if that holds any fascination for you, then go out and buy the new Elantra. The Corolla Altis on the other hand offers stronger residual and resale values. Its ownership costs are one of the lowest in the market. It's also bulletproof, almost. It is more efficient than the Elantra and offers decent performance even with that substantially smaller engine. Its ride quality, though not as good as the Elantra, will not have you complaining. And, we do know that Toyota's reputation as a carmaker far outweighs that of Hyundai, even though in this comparison it isn't ground on which to base an outcome. Both the cars are simply too close to pinpoint one as the winner over the other. So let's put it this way, the Corolla Altis is the safer bet! The Elantra, however, as an overall package offers just a little bit more, winning this comparison by a very slim margin.